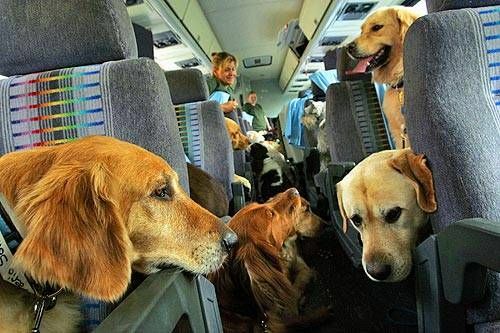 Dogs are property, so it makes sense that they are shipped as cargo by most major airlines. As aggravating as it is for the airline to misplace your luggage, it must be soul-wrenching to find that your companion has died during her trip. Yet since May of 2005, 122 dogs have died in transit on airlines, according to reports by the Department of Transportation, with 144 pet deaths overall , along with 55 injuries and 33 lost pets. Purebreds with short muzzles bear the highest risk of death or injury from overheating, since they are unable to cool themselves. Go ahead and add this to the number of health problems these dogs face. The responsibility to ensure pets survive their flights does not fall to the airlines. While there are regulations governing the air transportation of pets that require the airline to provide food and water, it is the passenger’s responsibility to not transport an animal in excessively hot or cold conditions. Many of the animal advocates with whom I’ve spoken will not put animals on airplanes even if they are careful about the carrier and the time of the flight. There are simply too many variables that cannot be predicted, including rapidly changing temperature and pressure in the cargo hold, or loose items shifting during the flight. Some airlines, recognizing these concerns, have attempted to provide more assurances of pet safety, but a quick scan of these policies shows that there are not many guarantees. Ultimately no one can predict what effect the stress and isolation of travel will have on an animal. Unfortunately there are times when even conscientious animal advocates are faced with situations that require shipping their pets. Once again, it falls to us to demand stronger minimal conditions for our animals if we want to ensure their safety. Thanks so much for raising such concern on behalf of all animal advocates. Something need to be done to effect favorable changes for our compernions – the animals. One of such is making noice like this.